Towards the end of the video when I was taking the pattern off the screen turns blue. Wait a little while and it will come back. There is a little more to the video after that. Very nice. Thanks for showing. 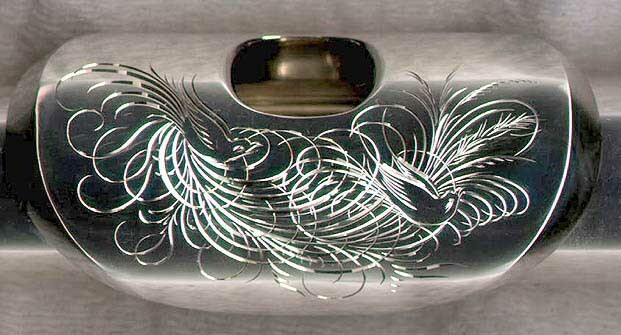 Do you engrave lip plates? The gold ones were usually rose gold 14k and 10k. 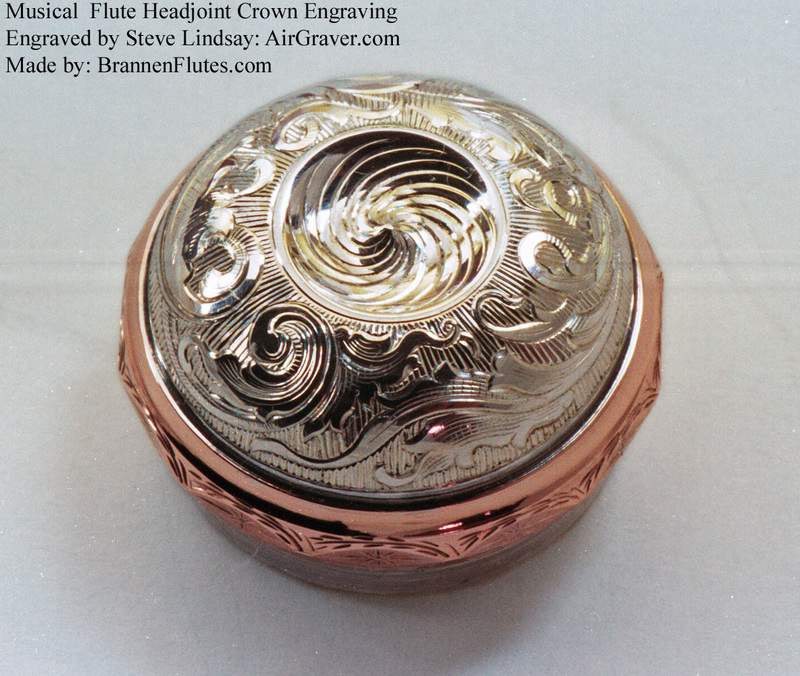 Brannen sent out a piece of gold with the bend in it for their logo to be engraved. They used a photo of it on their catalog. 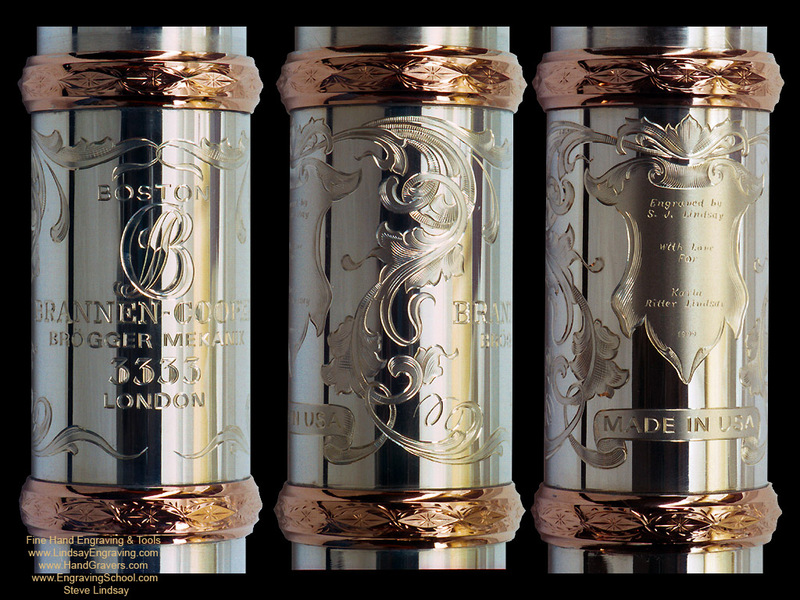 The gold foot joint tubes received a logo on them, silver did not. The headjoint tube gets the same logo. The barrel on the body receives more.. logo maker name with serial number. 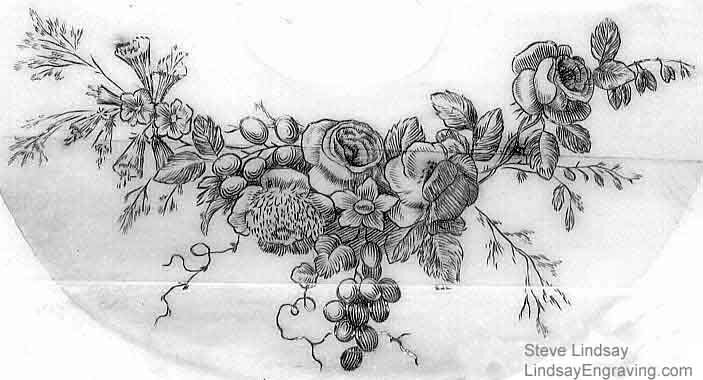 This is an ink print from roses design on a lipplate. Wow, super cool to see! Ist really nice to see these videos, and try to learn a little from it..
Don't know why but all I see is a black screen, the same as the other video. Steve, I assume all but the obvious flat cuts on the BOSTON letters you used a Universal 120 degree. Ray taught me to do lettering with a bright cut but Ive also used a 120 and it felt like I had a bit more control. I like the font you used and the letters, easiest seen in the lower case "h", where the long stroke has an angled cut that changes direction. Hope I was clear enough with that. 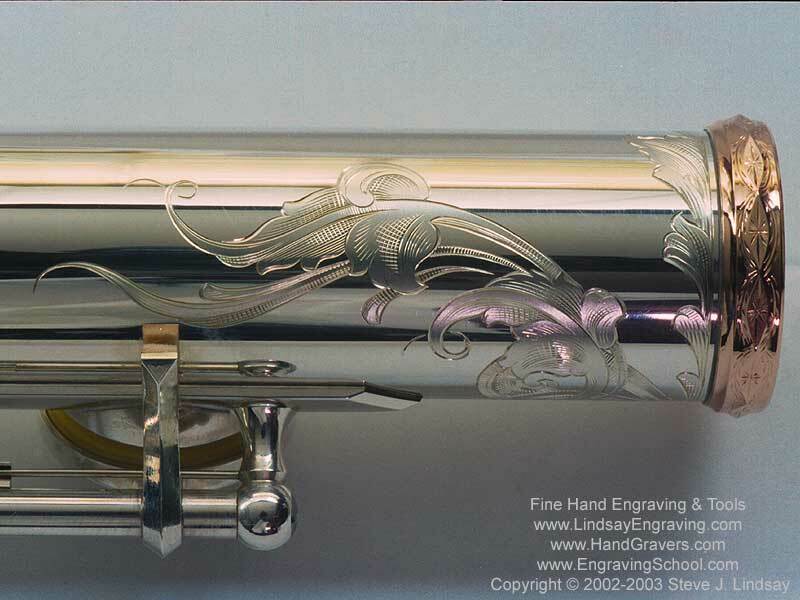 In any case nice work, love that rose pattern; Ill bet that looked fantastic on the instrument. Are you still doing these or is Tim doing them now. The screen goes from 'white', to 'black', and no video. I wonder why? The Boston block letters are with the 116 degree universal. The larger script is the 123 degree Calligraphy. At the ends of the block letter I'm just stabbing in a flat without a heel first. Then come back with the 116 and connect the stabs. 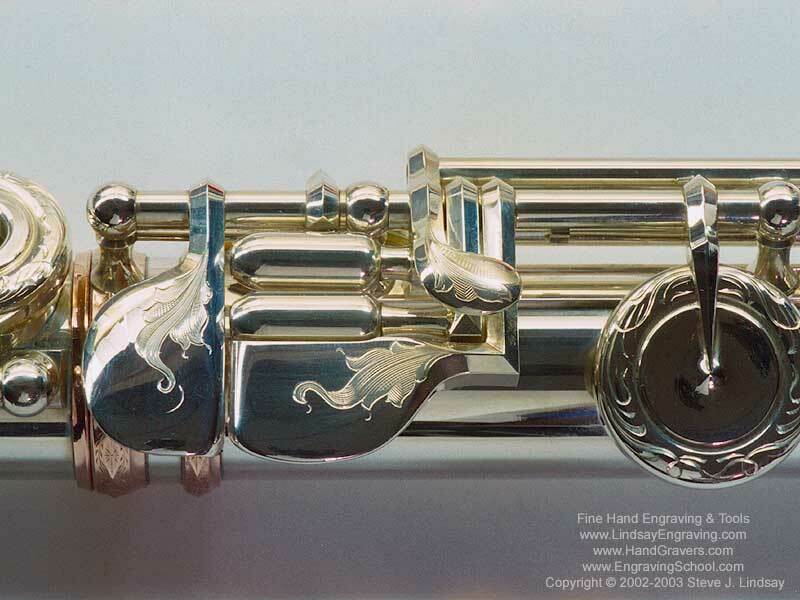 From 1994 to 2007 I engraved logos for various flute companies in the New England area. When the tools became busy I recommended Brian Marshall for the Nagahara account, and for Brannens flutes Andy Shinosky and Tim Adlam since Brannens produces more than Nagahara. Andy has been keeping up with all of Brannens the past few years though. My wife Karla teaches private flute and piano lessons. That is how I learned of these companies and contacted them in the 90s after seeing a flute magazine she subscribed to. 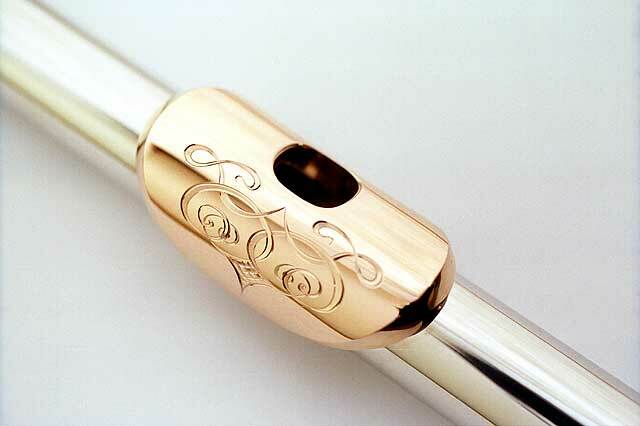 Later on we ordered Karla a Brannen flute with rose gold faceted rings. Brannens let us chose the serial number 3333. The one with the engrave body and levers posted above is it. Here is the barrel joint and crown at the end of the head joint. From a wish I had one of these flutist, truly beautiful. Very nice work, must have been nice to be able to order the instrument for her and then be able to add your personal art to it for what must be something she treasures.